While today we all know Melvin Goodge as a professor of Speech Bubbles at the Huntley Smoot University for Comic Sciences, way back in 1978 he was just a fresh-faced associate editor hungry for a little experience and a job that paid something to do anything at all with words. After answering a couple classified ads and landing just one interview, he wound up in the offices of Ringer Publishing Paperbacks. But somehow, Goodge wasn’t assigned a pile of submissions to read or a pile of breakfasts to purchase for the senior editors; by happenstance and two fortuitously timed sick days his first task was the plum assignment of shepherding into being the first paperback to feature all-new material from the hit comic strip Frank and His Friend. It must have been daunting. Although cartoonist Clarence “Otis” Dooley was only ten years older than Goodge, he was at the top of his game. Frank and His Friend was riding a wave of success, where readers just couldn’t get enough of his adorable characters, and Dooley had been given a lot of control from both Button Features Syndicate and Ringer. Goodge was essentially a kid; not long out of college and without any experience in comics aside from his love of the Mort Walker and Johnny Hart strips of his youth. 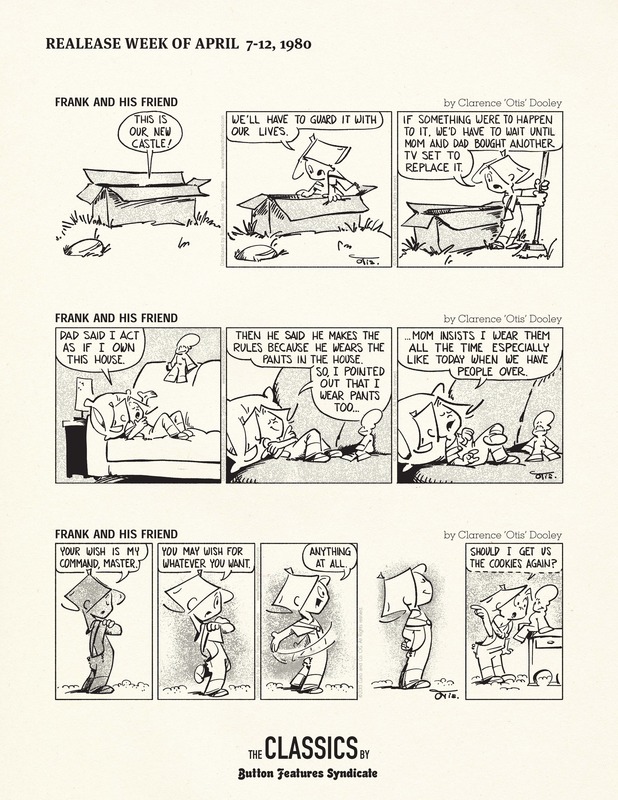 A page from a Button Features press kit promoting “Frank and His Friend.” This was used to drum up new subscriber newspapers. Image borrowed (stolen) from the Curio & Co. archives. But if Goodge was worried, it must have faded quickly. The two men hit it off right away, bonding over their bottle cap collections and shared love of slot car racing, and this in turn led to one of the most fruitful professional relationships during that era of comics history. While the decision to publish a collection of brand new strips instead of previously syndicated ones is somewhat lost to the ages (Goodge has recalled the origin story with slight variations whenever he’s asked about it at comics conventions), the net result was 1979’s Time For Frank and His Friend, and it was nothing short of a sensation. (The long out-of-print book is luckily still available today from the pop culture enthusiasts at Curio & Co. who recently acquired a well-preserved treasure trove of backstock.) Today we enjoy an embarrassment of riches of what we now call “original graphic novels,” with many top-flight cartoonists laboring for years on what will eventually be bound volumes of never-seen-before comics. But imagine what it was like as a comics fan in the 1970s, with only the ephemeral newsprint comic books that disappeared from newsstands every month or the comic strips in the daily newspapers that disappeared even quicker, only to maybe be seen again in loosely scheduled paperback reprints. 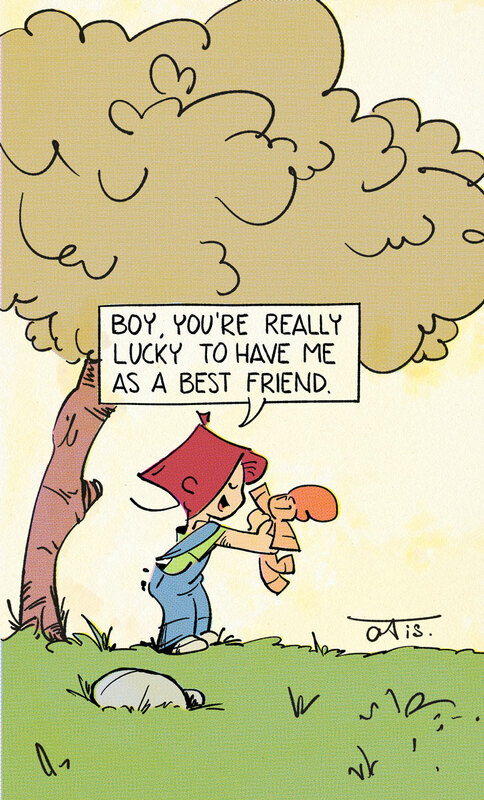 For the thousands of devoted Otis fans, a book of new comics, announced and publicized and bound for permanence, was something to celebrate, and celebrate they did. I know it’s a fannish stretch to say that this creation of Otis and Goodge was the start of the graphic novel. It Rhymes With Lust by Arnold Drake and Matt Baker was indisputably first in 1950, right before Harvey Kurtzman’s even more ground-breaking Jungle Book in 1959, and of course, Will Eisner’s A Contract With God made its debut a scant few months before Time. But if we momentarily shelve history’s obsession with finish-line-crossing and look objectively at Otis’s accomplishment, it’s clear that his was the first graphic novel with real mass market success, with already successful characters. Bound comic strip reprints may have been a popular novelty, but Time For Frank and His Friend made booksellers and the public at large think of comics as something that could make up a “real” book, a revolutionary seed that was later sown by 21st century graphic novelists. Through their work on the book and the other Frank and His Friend publications for Ringer, Goodge and Dooley became real friends and spent time together off the project with their wives and children. Dooley’s untimely death in 1984 hit Goodge pretty hard, and he edited only two more books before he left his job, intending to get out of publishing altogether. But while cleaning out his office he came across notes that Dooley had sent him during that very first project explaining his philosophy of comics, and Goodge realized that his journey had only just begun, and there was more to learn from Dooley’s work. He went back to school and eventually earned a Doctorate in Comics. Today he’s not only the leading expert in Dooley’s work but arguably the most noted scholar of late-century strip cartoonists, period. From best sellers to best friends, it all comes down to relationships, and that might be why Goodge’s story is so resonant with me and apropos to our mission at Letter Better. Genius can flourish by itself but it’s often the pairing of minds, the team-up, the village that lights an unexpected spark to illuminate something completely new, something the world actually needs. Goodge’s story proves that when you’re well matched, there’s no telling where you can go. This entry was posted in Comics, Publishing and tagged Arnold Drake, Books, Button Features Syndicate, Comics, Curio and Co, Frank And His Friend, Graphic Novel, Harvey Kurtzman, Johnny Hart, Matt Baker, Melvin Goodge, Mort Walker, Otis, Publishing, Ringer Publishing Paperbacks, Will Eisner. Bookmark the permalink.